← Next Month, Don Your Ugliest Sweater and Visit the Peninsula Library and Historical Society for a Movie, a Raffle and a Bizarre Bazaar! When You’re 96, How Should You Wash Your Clothes? Come over during the holiday season and you’ll meet Hilda, a 96-year-old member of our family who likes to admire Christmas decorations from her favorite rocker. Opening the first door of the Advent calendar reminded us that it was time to help Hilda look her best for the holidays. 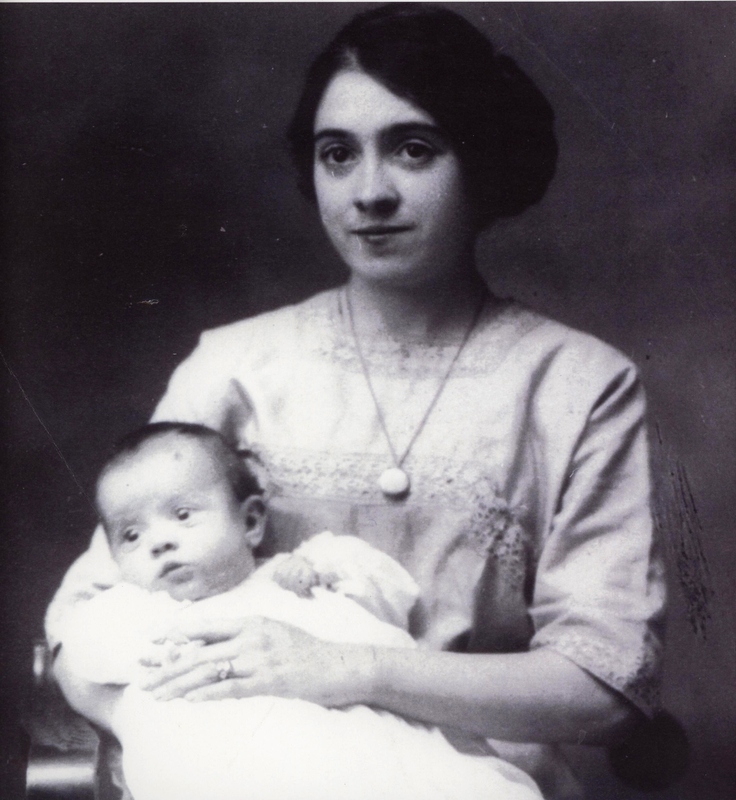 Hilda joined our family in 1917, when my grandmother received her as a Christmas present. My great-grandfather, a sales clerk at the John M. Caren Co. in downtown Columbus, worked with the store’s buyer to purchase a doll for his five-year-old daughter. 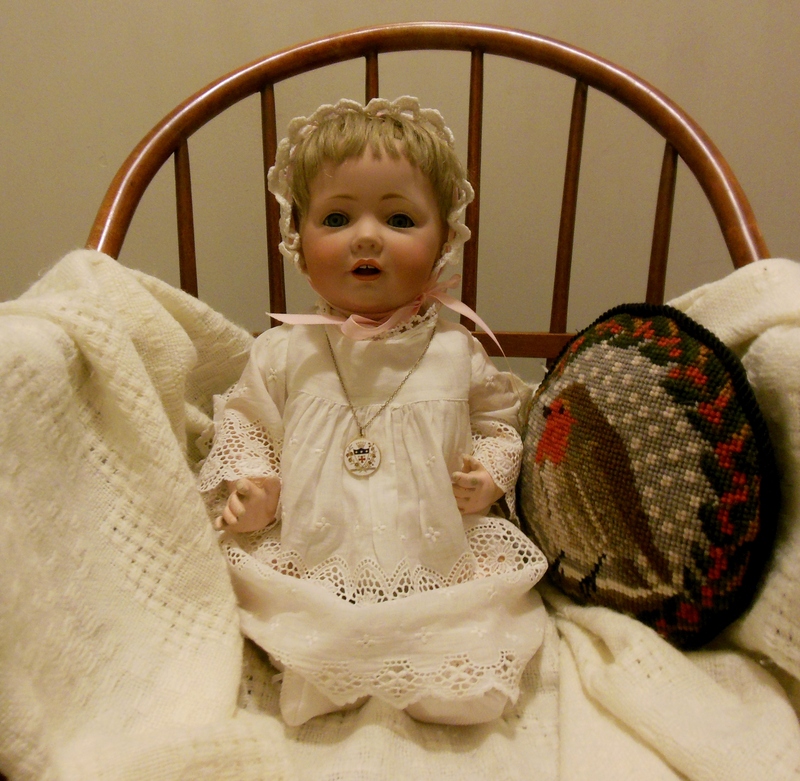 He chose a 14-inch German Kestner baby doll with blue eyes that close, real human hair, and markings on the back of her neck that read “Germany,” “#245,” “J.D.K., Jr.,” “1914” and “Hilda.” Since Hilda didn’t come with an outfit, my great-grandmother transformed her wedding blouse into a stylish dress, chemise and undergarments for Hilda, then crocheted a matching cap and socks to match. My great-grandmother is wearing her wedding blouse as she holds my grandmother in this 1912 photograph. 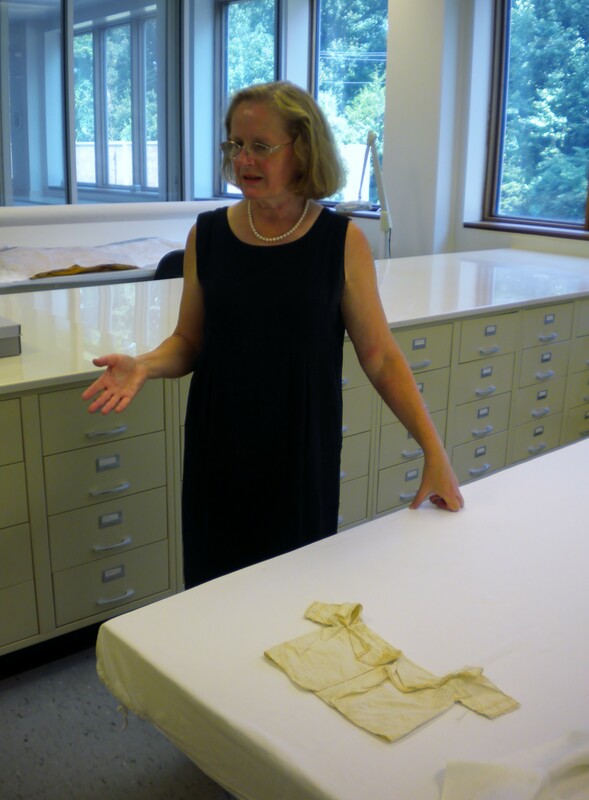 Hilda’s special outfit is very delicate, so we laundered it using a technique to clean antique textiles that Loreen Finkelstein, textile conservator at Colonial Williamsburg, shared with my mother during her visit to the DeWitt Wallace Decorative Arts Museum and Abby Aldrich Rockefeller Folk Art Museum in July. 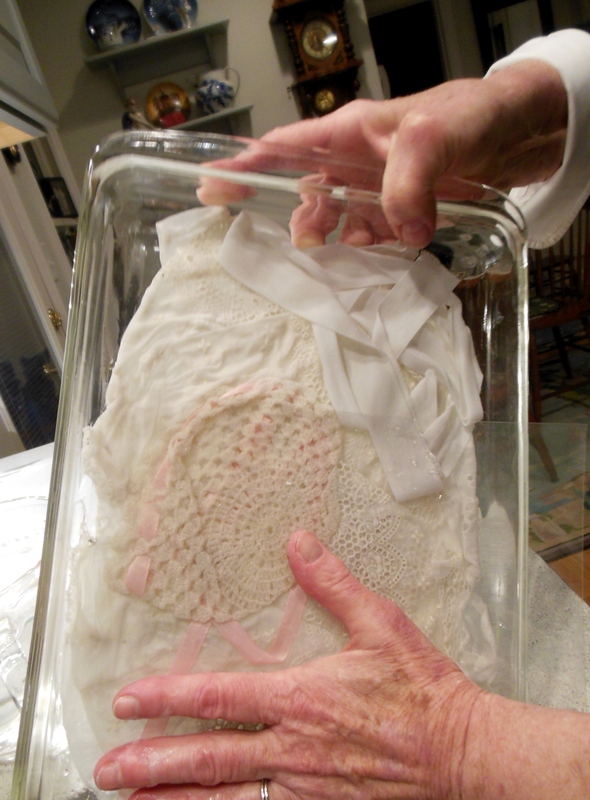 Finally free of her twill tape seat belt, Hilda huddled under Cindy’s Cathedral Window quilt as we arranged her outfit in a glass baking dish. We poured a quart of distilled water that had been heated to 80° Fahrenheit over the garments and let them rest for 15 minutes. 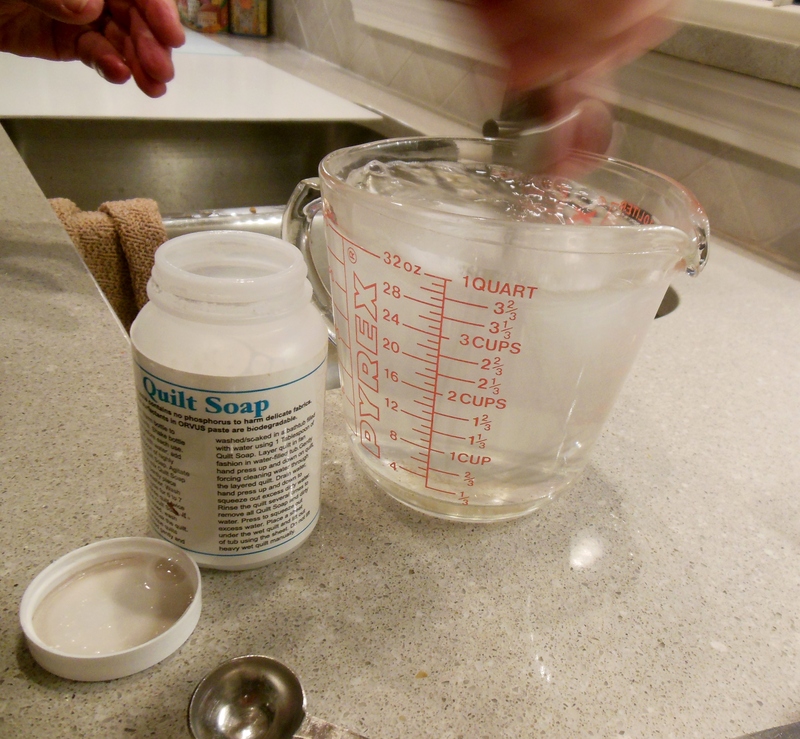 While the garments rested, we heated another quart of distilled water to the same temperature, then whisked in about half a teaspoon of Quilter’s Rule Orvus Quilt Soap, a highly concentrated soap that does not contain the phosphorous that can harm delicate fabrics. 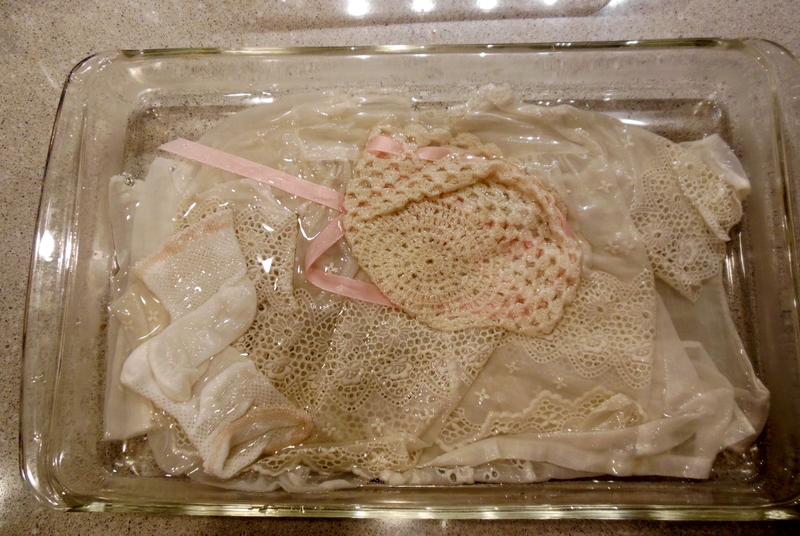 Using a sheet of acetate to hold the garments in place, we drained the distilled water out of the baking dish. 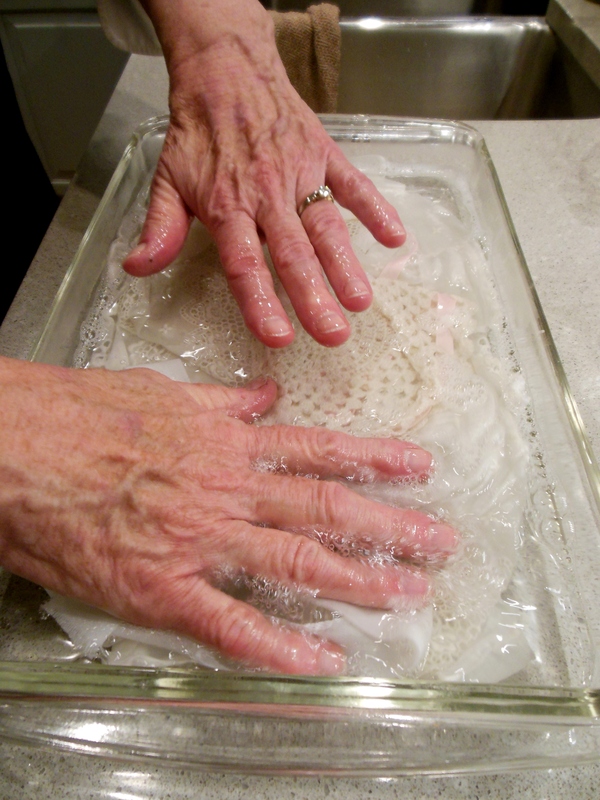 After we poured in the soapy water, we gently pressed the garments with our fingers for a few minutes. 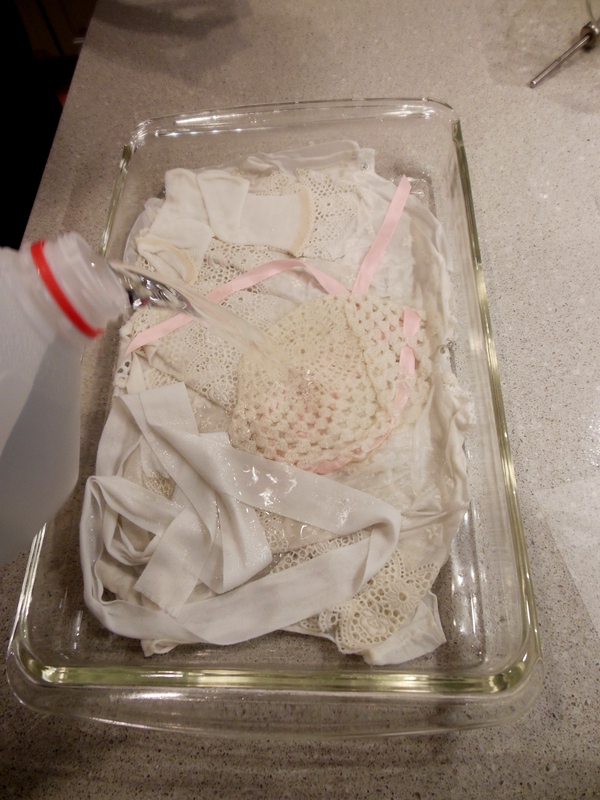 Then, we put the acetate on top, poured out the soapy water, added more distilled water and rinsed the garments, gently pressing them some more. So as not to strain the threads of the clothes, we used the acetate sheet to lift each piece out of the distilled water and onto glass cutting boards. 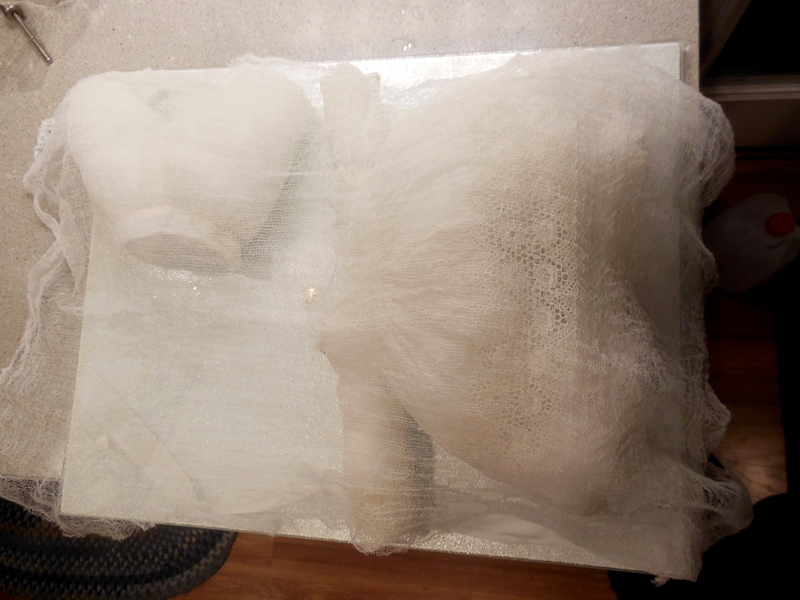 We carefully stuffed the garments with polyester fiberfill and covered them with cheesecloth to dry. The stuffing step helps the garments dry without wrinkling and eliminates the need to press them after they have dried. 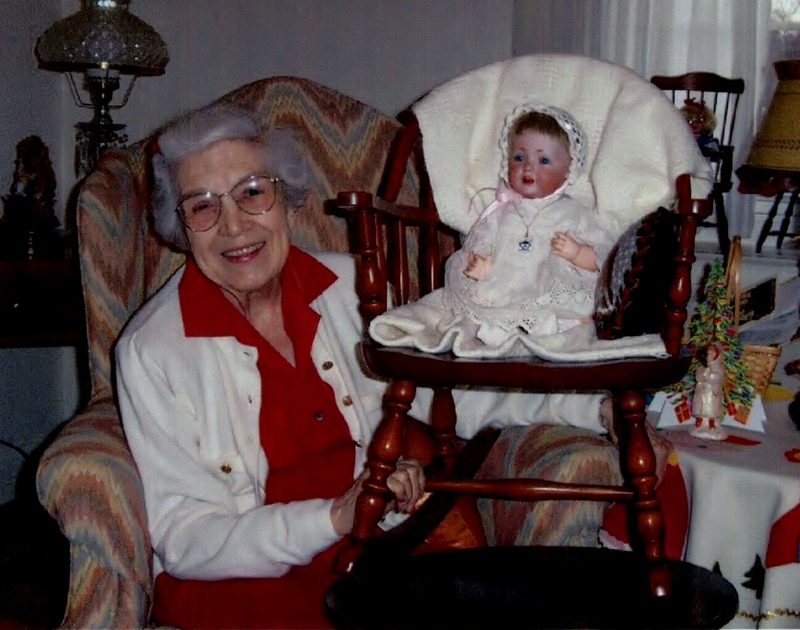 Yesterday, Hilda put on her freshly laundered outfit and took her place on the rocker, ready to enjoy the Christmas decorations, like she did here with my grandmother. This entry was posted in Family, Holidays, Miscellanea, Museums, Special Collections. Bookmark the permalink. 1 Response to When You’re 96, How Should You Wash Your Clothes?